Real-world guidance for todays anatomy lab. Illustrations drawn from real specimens, presented in surface-to-deep dissection sequence, set Grant s Atlas of Anatomy apart as the most accurate reference available for learning human anatomy. These realistic representations provide students with the ultimate lab resource. 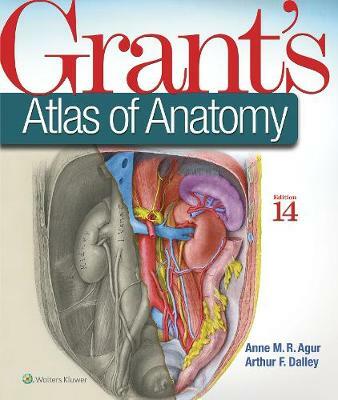 For more than seventy years, Grants Atlas of Anatomy has continually adapted to meet the needs of each generation of students, while maintaining the Grants tradition of excellence. The meticulously updated fourteenth edition is a visually stunning reference that delivers the accuracy, pedagogy, and clinical relevance expected of this classic atlas, with new features that make it even more practical and user-friendly: -Recolorization of the original Grants Atlas images from high-resolution scans add a new level of organ luminosity and tissue transparency, and enable the formation of 3D constructs for each body region. This lavish visual enhancement ensures a vastly improved experience in learning the structure and function of the human body. -Schematic illustrations now feature a uniform style and consistent coloring, clearly showing the relationships of structures and clarifying anatomical concepts. -Newly revised legends with highlighted clinical applications describe the anatomic features and provide context for health care practice. -Enhanced medical imaging includes more than 100 clinically significant MRIs, CT images, ultrasound scans, and corresponding orientation drawings. -Updated and improved tables help organize muscles, vessels, and other anatomic information in an easy-to-use format ideal for review and study.